It's getting ready to pour right now, and I don't think I could be happier. It'll save me from having to collect gray water to water the plants, and it'll wash away some of the thick layer of yellow dust that's been piling up on every surface. I went to take some better pictures of some of the items on my listings, and everything has this weird yellow, powdery look to it. 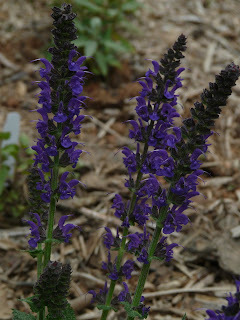 As you can see from even on this Salvia 'May Night' flower, it's everywhere! This plant just broke dormancy a couple of weeks ago, and it is living up to it's name. They're blooming like crazy, and the purple is a terrific contrast to the yellow.